Silica Cloth | GarCo Manufacturing Co., Inc.
AMATEX Silica cloth is a woven continuous filament amorphous silica fabric. Applications include pad fabrics, expansion joints, valve covers, special curtain materials. Resistant to most chemicals, good thermal protection to temperatures up to 1800 degrees F.
18.5-oz Silica Cloth with Natural Tan Vermiculite Finish. Available in 35″ and 60″ widths. 18-oz Silica Cloth with Natural Tan Vermiculite Finish. Available in 36″ and 60″ widths. 34-oz Silica Cloth with Natural Tan Vermiculite Finish. Available in 35″ width. 33-oz Silica Cloth with Natural Tan Vermiculite Finish. Available in 36″ and 60″ widths. 27-oz Silica Cloth with Red Silicone Rubber on One Side and Tan on the Reverse. 35-in minimum width. 42-oz Silica Cloth with Red Silicone Rubber on One Side and Tan on the Reverse. 35-in minimum width. 21-oz Silica Cloth with Aluminum Laminate (one-side) and Natural Tan on Reverse. 35-in minimum width. 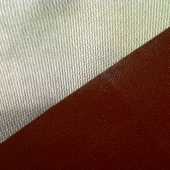 38-oz Silica Cloth with Aluminum Laminate (one-side) and Natural Tan on Reverse. 35-in minimum width. This entry was posted on September 9, 2015 by GarCoMfg in Amatex, Insulation, Products, Silica, Textiles, Woven and tagged Aluminized, Amatex, Amatex Broad Cloth, Cloth, Silica, Silicone, Vermiculite.